Today's election in Russia will bring another empty political spectacle to a close. But the contest over the country’s future will just be getting started. The beauty of Russia’s presidential campaign season is that it’s a short twelve weeks. Which is good, since its novelty wears off quite quickly. The drama between candidates is mostly a scripted spectacle. Enthusiasm is a concoction. And in terms of policy and vision, the campaign is bereft of content. Increasingly since Vladimir Putin took office in 2000, politics has mattered less and less during election season, when it goes into a kind of hibernation. It’s immediately before and after the campaign period that the political atmosphere tends to grow most intense, as ruling class elites jockey for position, spoils, and influence. Since the dawn of the millennium, the candidates challenging Putin haven’t mattered much. And today they matter even less. Vladimir Putin is set to win his fourth presidential bid in today’s election. But it’s wrong to call it an election. It’s really a referendum on a single question: do you want Vladimir Vladimirovich Putin as president for six more years? A vote for Putin is yes — but so is a vote for any of the other seven candidates: Ksenia Sobchak (Civic Initiative), Pavel Grudinin (Communist Party of the Russian Federation), Maxim Suraykin (Communists of Russia), Vladimir Zhirinovsky (Liberal Democratic Party), Sergey Baburin (Russian All-People’s Union), Boris Titov (Party of Growth), and Grigory Yavlinsky (Yabloko). Any vote is a vote for Putin since the election is a PR-driven referendum on Russia’s present, not an occasion to choose its future. Given the rigidity of the system, the only real vote against Putin is to abstain altogether. Putinism is increasingly exhausting itself as its internal contradictions become more visible. It’s easy to forget that it once had a certain élan. 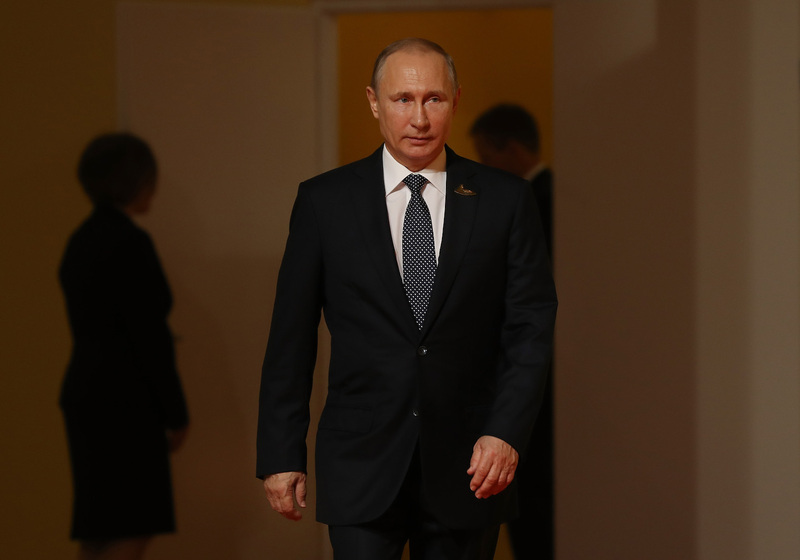 In his first two terms, Putin could point to the chaos of the 1990s and offer stability and economic growth in exchange for political acquiescence. Incomes rose, a post-Soviet middle class emerged, and Putin personally and institutionally consolidated power. When this social contract became less tenable after the 2008 crash, Putin switched gears. Facing mass protests in 2011–12, he appealed to the so-called “silent Russian majority” with a more culturally conservative stance against the danger posed by “Western values” within Russia and without. This national cultural turn reached its apex with the annexation of Crimea and Russia’s support for separatists in the Donbas region of Ukraine in 2014. Russia was now a great geopolitical player again. But the “Crimea effect” yields diminishing returns. Seizing the peninsula remains popular, but the patriotic euphoria has lost its buzz. Military intervention in Syria has produced little fanfare to capitalize on. Cranking up tensions with the United States, though always a go-to move, brings only ephemeral returns. Russia as besieged fortress only plays for so long in such a cosmopolitan country, especially as its economy stagnates, real incomes shrink, and the political space to express grievances become narrower and narrower. Today, all Putin can offer is himself. His campaign slogan reflects this: “A strong president is a strong Russia.” Putin is painted as the indispensable figure — not for ushering in Russia’s future, but for the survival of Russia itself. Or as Vyacheslav Volodin famously put it in 2014, “There is no Russia without Putin.” The object of the upcoming referendum is to reaffirm Putin’s two bodies — to deify his corporeal flesh and close the gap between himself and the body politic. In the minds of television viewers and even the Kremlin’s critics, the inertia of his former power reigns. Even today, the official campaign began in conditions of a lack of strategy, having lost command over the script, [but] the opinions of observers, their language and vocabulary are directed at “Putin’s campaign.” But there is no campaign. Such a high turnout target is a recipe for electoral fraud as local potentates are pressured to mobilize the vote. A 70-70 outcome is ideal, but Kremlin sources say they will settle for 65 percent since that was the turnout for Putin’s election in 2012. But a key difference from 2012 is that regional officials are now expected to produce high turnout without mass falsification. “Governors have been repeatedly told,” a Kremlin source told RBC, “that falsification will be severely punished, although of course the use of ‘administrative resources,’ are allowed, but the majority [of governors] are simply afraid of falsifying the vote.” Whether this will prove to be the case remains to be seen. The pressure to get Russians to the polls has resulted in the use of more coercive means. Russia’s Central Electoral Commission has received over three hundred complaints about voters, mainly public employees and students, being pressured into voting, particularly at their workplaces and universities. One of the largest examples is the Moscow City Transportation Agency, whose thirty thousand workers were “urged” to vote. Utilities workers have complained of similar tactics. Employees at Rosneft, Russia’s largest oil company, received a letter saying they had to take a selfie of them voting to show their superiors. Other state offices and businesses are offering voters free movie tickets and grocery store discounts. Some cities are increasing bus service or just making public transportation free. In other cases, local police are paying visits to, and outright persecuting, election boycott activists, especially supporters of Alexei Navalny — searching and detaining them, confiscating their leaflets and placards, and charging them with “violating” people’s right to vote. Vova (our leader), darling Vova. Vova (a dreamboat), our favorite boss. Vova, (a commander), darling Vova. Vova, (he’s the only one). Since the 1990s, Russian presidential elections have featured off-and-on guest stars playing characters that represent the “loyal opposition”: Vladimir Zhirinovsky, Grigory Yavlinsky, and Gennady Zyuganov. This year’s election mixed things up a bit to give it some flair. The Communist Party swapped Zyuganov for Pavel Grudinin, owner of the ironically named Lenin State Farm outside of Moscow. Grudinin and his supporters boast of his business as an “oasis of socialism” since his workers receive decent pay and Soviet-era benefits. He represents the so-called “patriotic left,” a mixture of neo-Stalinists, left-nationalists, and elderly communists. His Twenty-Point Program consists of mostly boilerplate left positions: restoring Russia’s economic sovereignty, nationalizing the economic commanding heights, redistributing wealth, expanding social programs, guaranteeing worker pay, rights, and pensions, and revitalizing rural Russia, among others. Grudinin has played his role well, as state television has cast him as a legitimate challenger and foil. He’s currently polling second, at around 7 percent. Another twist in this year’s election drama is the candidacy of Ksenia Sobchak, TV host, socialite, daughter of one of Russia’s early democrats (Putin mentor Anatoly Sobchak), and allegedly Putin’s goddaughter. Sobchak is the election’s anointed “opposition liberal” candidate and stand-in for Alexey Navalny. The Kremlin refused to let Navalny run, citing his felony conviction for embezzlement. The move to bar Navalny’s candidacy wasn’t out of fear he would win; he’d get 7 to 10 percent of the vote at most. It’s about preventing him from obtaining a wider platform, since his candidacy would have given him a right to television time to broadcast his message and build his brand. Navalny is playing the long game, and there was no way the Kremlin was going to play along for the sake of legitimacy. So Sobchak was allowed to run instead. She initially billed herself as the “none of the above” candidate, but since then her campaign has waffled between serious and superficial. The strangest moment included a trip to the United States, where she spoke to DC think tanks and the media. Sobchak’s program is a 123-point laundry list of liberal political and technocratic positions concerning Russia’s domestic and foreign policy. Nothing in it stands out as either particularly notable or offensive. She’s polling at around 1.3 percent. It is widely suspected that Sobchak is in the Kremlin’s pocket, though she consistently insists she’s sincere. Recently she announced she’s joined forces with former Just Russia deputy Dmitry Gudkov, but to what end no one really knows. Even assuming they’re sincere in their aspirations, Grudinin and Sobchak were nonetheless sucked into the Russian campaign vortex. Putin refuses to participate in debates, and after watching a few minutes of them, you can see why. They’re designed to implicitly affirm Putin as the only plausible candidate among a roster of clowns and to depict the trappings of the democratic process itself as being beneath respectable people like him. After attending one debate, Grudinin rightly declared them a circus, walked off stage, and refused to participate. Two weeks later he was back on, but walked off again when Communists of Russia candidate Maxim Suraykin brought onstage a woman accusing Grudinin of evicting her family. Grudinin fled the stage, everyone began screaming, and Suraykin tried to attack pundit Maxim Svechenko (who isn’t running for president but was in the debate anyway as Grudinin’s backup). Pandemonium ensued. Sobchak, too, has been subject to intense harassment and verbal assault, particularly from Vladimir Zhirinovsky, who called her a “prostitute” and a “total whore.” Sobchak responded by throwing a glass of water in his face. All of this on live state TV. In one debate, the abuse brought Sobchak to tears. You wouldn’t need to understand Russian to get a sense of the insanity. The Russian left’s stance on the presidential election reflects the split within the wider left camp that has opened up since the Crimea annexation. Given the Russian left’s marginality, it’s been reduced to being reactive rather than proactive. Consequently, its debate over the election focuses on whether leftists should back Grudinin or support Alexei Navalny’s call for a boycott. The Left Front, led by fresh-out-of-prison Sergei Udaltsov, stands firmly with Grudinin (who came in second in the LF’s own primaries). Udaltsov has been campaigning for the Communist Party candidate and urging his supporters to vote under the banner of a “united left.” Other leftist organizations, like the Left Bloc and Russian Socialist Movement, call for the “maximum consolidation of actions” against these “false elections” — election monitoring, boycott, damaging ballots, and solidarity with those who decide to vote for one of the “opposition” candidates. The lack of politics in Russia’s elections doesn’t mean that politics are absent as such. Protest activity markedly increased over the course of 2017, opening crucial spaces for Russian leftists to participate. Most of these protests concern ecology, labor, social and economic issues, and general corruption among Russia’s political and economic elite. Meanwhile, the Russian authorities have intensified their crackdown on the Left. In January, the courts declared the Interregional Trade Union (MPRA), one of Russia’s few independent trade unions, a “foreign agent,” resulting in its legal liquidation. There has also been a series of fabricated cases, arrests, and torture of anarchists and antifascists in Penza and Nizhny Novgorod. All in all, Russia’s presidential referendum represents a fleeting moment within a longer political struggle for democracy and social justice in Russia. And the intensity of Russian politics is destined only to increase — not just geopolitically but, more importantly, domestically — as by all accounts this will be Putin’s last term. Putin’s inauguration in May will be the opening salvo in a new phase, as various forces in the country begin jostling to define the contours of Russian politics not only during this presidential term, but beyond it. As for the Russian left, its future will be determined by its active participation in political, social, and cultural spaces and the cleavages that emerge. Sean Guillory is the host of the SRB Podcast, a weekly podcast on Eurasian politics, history, and culture and the digital-scholarship curator in the Russian and East European Studies Center at the University of Pittsburgh.